Yikes! 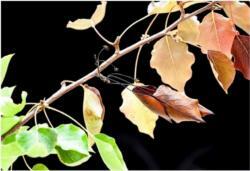 What has happened to the ornamental pears this summer? 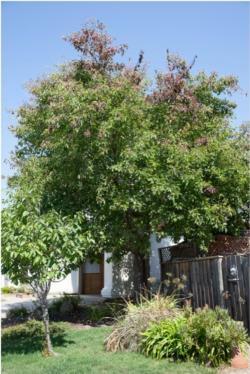 In many areas, the ornamental pear trees (Pyrus calleryana) have severe branch dieback caused by a bacterial disease called fireblight. This bacterium can also cause disease on fruiting and evergreen pear, apple, crab apple, quince, cotoneaster, pyracantha , among other similar plants. These current symptoms are a result of infections during the spring. Diseased wood oozes with the bacterium and spreads to open flowers in splashing rain or by insects that visit the flowers. Even honey bees can move the bacterium from flower to flower. The open flowers and young fruit are susceptible to infection and they along with associated infected stems shrivel, droop, and turn black, as though they were burned in a fire. The bacterium can develop internally into larger stems and branches, and even the trunk. Ideal conditions for infection, disease development, and spread of the bacterium are rainy or humid weather with daytime temperatures from 75° to 85°F, especially when night temperatures stay above 55°F. These infected branches can be best pruned out now when they are clearly visible. In the winter they will not be as obvious, and next year, in early spring, the infected wood will begin to ooze more bacteria again and the disease cycle will continue.